The 2007 Rally America National Championship came to a conclusion at round nine, the Lake Superior Pro Rally. The excitement reached a pinnacle as the Overall, Open, Production GT, Group 5, and Production titles were all on the line. For the Flatirons Tuning Rally Team their championship ambitions had already come to a close after a difficult season of highs and lows. After a devastating crash had ended the Boulder, CO, based team’s 2006 campaign, 2007 got off to a promising start at round two in the Rally America National Championship with a new car and driver at the 100 Acre Wood Rally in Salem, MO. Despite the expected challenges that breaking in a new car and driver combination brought the Flatirons Tuning Rally Team was able to find the right balance of speed and patience to win on their debut. With hopes high and the car evolving, the championship then took teams to Oregon for round three, the Oregon Trail Rally. The Oregon Trail Rally, based outside of Portland, OR, had great promise for a second great showing as it represented one of the two events the team’s new driver, Stephan Verdier, had campaigned before. With a balanced combination of speed and patience the Flatirons Tuning Rally Team again found the end of the rally as the fastest finishing Production GT team. Having debuted by winning their class in the first two rallies, expectations and morale were high going into round four at the Olympus Rally in Shelton, WA. The Olympus and Susquehannock Trail Rallies were going to be an important point in the season, with only a couple weeks in between the rallies that where on opposite sides of the country teams would have to push to get a good result at Olympus but make sure not to damage the car as it would be difficult to make repairs in time for the next round. This important point in the championship calendar would prove critical for the Flatirons Tuning Rally Team. While running at a controlled but high speed pace at Olympus which was on schedule to put the team in second in Production GT, the up pipe leading to the teams turbo on their 2004 Subaru WRX started to leak before suffering a catastrophic failure ending the team’s rally and damaging the electrical systems on their Subaru. “Olympus was tough for us, things were going to plan, we had shown we had the pace to match 2006 Champion Johnson and even though we had some problems that put us out of contention for the rally win, a second place finish would have been good for the championship. To have had such a fluke mechanical failure there was really devastating. It was a really difficult task to get the car repaired and re-prepared for the Susquehannock Trail Performance Rally, and while a driving error cost us the Susquehannock rally early on it was a testament to our technician Jon Brouillet that we were even able to start the rally,” commented Flatirons Tuning driver Verdier. After the disappointing “Did Not Finish” results at Olympus and Susquehannock Trail, the Flatirons Team looked to rebound at the New England Forest Rally. At New England the Flatirons Team was able to once again find a winning balance between speed and patience to take advantage of Johnson’s absence from the PGT category to win Production GT for the third time in the season and move into position to challenge for the 2007 championship. Round seven, the Ojibwe Forests Pro Rally, would provide the Flatirons Tuning Rally Team with an opportunity to take the driver’s seat in the Production GT National Championship before heading into the home stretch. “With Patrick [Moro] leading the championship but skipping Ojibwe we really wanted to take advantage and win the rally. When Matthew [Johnson, 2006 Champion] crashed on the second stage we couldn’t have asked for a better position championship-wise. We moved into the lead and were never really pressured by any of our other competitors. On the last stage, with the rally won, I made a mistake and we left the road almost ending up in a lake so we weren’t able to finish the rally. That was really hard result to accept,” said Verdier. The Flatirons Team’s fortunes looked set to make a last-second turn for the better at Rally Colorado, as the combination of the Boulder, CO, based team’s knowledge of altitude rallying paired up well with Verdier’s previous experience at the rally. The team entered into a fierce battle with Johnson until y-pipe problems plagued the team, sending them down to fourth and handing the Flatirons Team their first finish not on the top step of the podium. The season of extremes came to a close at the finale Lake Superior Performance Rally. After suffering a combination of a driver error, mechanical malfunction, and difficult weather on day one, the Flatirons Tuning team crashed their 2004 Subaru Impreza WRX rally car heavily damaging the suspension, forcing the team to withdraw from the event for the fourth Did Not Finish of the season. “I am both really happy and really sad with how the season went. I think we showed we had the speed needed to win the championship, but we didn’t have the consistency. Even though all the teams start with the same notes at events, experience is really important at the rallies. While the team had experience at all but one rally I personally had only done two of the rallies before, and just having more experience at the rallies in the championship probably would have saved us two Did Not Finish results. Our wins at 100 Acre Wood, Oregon, and New England Forest Rallies proved we can win, and our 48 stage class wins and a total of 72 class top two stage times, as well as numerous top five overall stage times, showed we can challenge anyone in the Production GT field and that is something to be proud of despite our bad luck. I am very thankful to Flatirons Tuning and Scott Crouch for the opportunity to drive for the team and to Flatirons Tuning technician Jon Brouillet whose hard work and dedication helped bring the car up to spec and whom gave us a great car and support at every rally. I also want to thank our sponsors at TCI, COBB Tuning, Prodrive, as well as all the other people that helped make this season happen,” reflected Flatirons Tuning driver Stephan Verdier. “This has been a tough season for us. We showed we can be the fastest in Production GT but we didn’t get to have as many great problem-free rallies as we would have liked. Both Patrick Moro and Matthew Johnson ran great seasons, Patrick was able to find incredible consistency and the podium at every round and Johnson was able to find the speed and stay out of trouble down the home stretch. For us 2007 has been a real emotional roller coaster between the class wins and DNF’s, but competing with our fellow Production GT competitors has been a real pleasure. 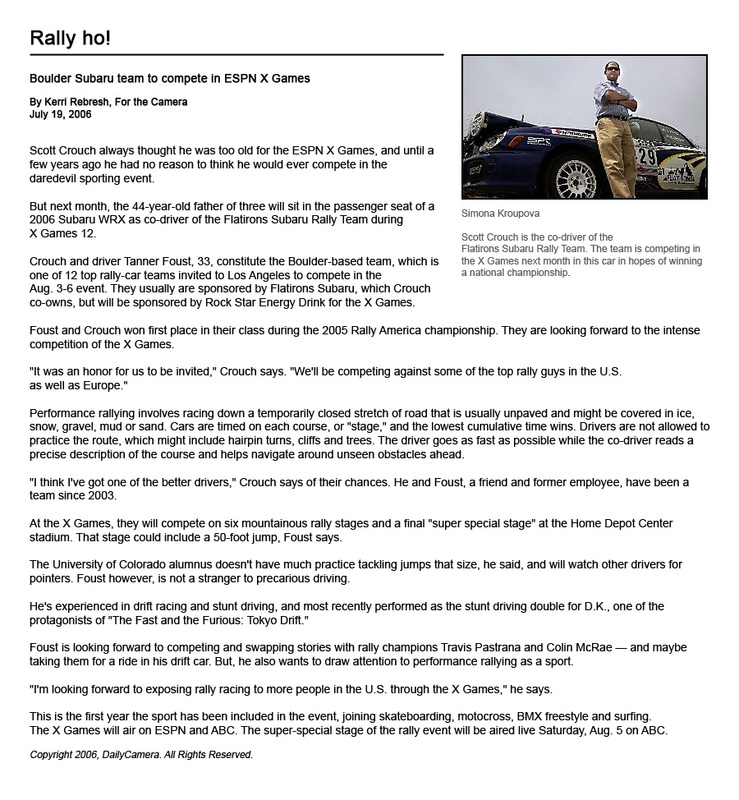 Hopefully we’ll be able to find the partners and support we’ll need to be able to put together a program for 2008 and see if we can finally bring the Production GT National Championship back home to Boulder,” stated Flatirons Tuning co-driver Scott Crouch.